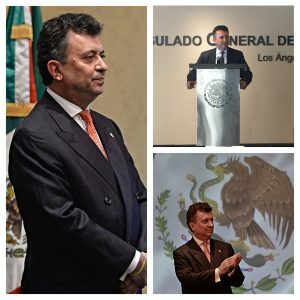 This week we’re hearing from Ambassador Carlos García de Alba, the Consul General for Mexico in Los Angeles on “The New NAFTA: Mexico-US Relations & Trade in the Trump Era.” The ambassador shares his views on the relationship between the U.S. and Mexico. He also discusses what all of the North American countries have to gain by working together instead of moving apart. Carlos García de Alba, served as Ambassador of Mexico to Ireland from 2011 to 2016. He was Chargé d’Affaires a.i. in the Representation of Mexico at the Organization of Economic Cooperation and Development, (2006-2007). He was Consul General of Mexico in Dallas, Texas, (2004-2006) and Commercial Counselor at the Embassy of México in Italy (1989-1993).